Facilities : Fruit machines/Golf/Trivia Machine, large downstairs. The entrance pictured above is the to the smaller upstairs bar, most of this pub is underground running along the length of number 1 Poultry. There is a separate entrance to the lower bar area, via Bucklersbury Passage and the escalator or, you can use the stairs from the upper bar. The Green man is a pretty standard JD Wetherspoon's pub, good range of beers and there's usually a couple of interesting guest beers to be sampling. The downstairs bar gets plenty of food orders during the day and being well priced there is a mix of clientele from young city workers to builders in the evenings. 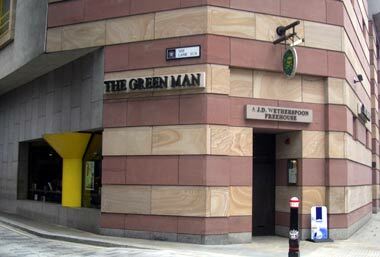 The name Green Man comes from the pub that once stood at this location prior to the construction of Number 1 Poultry. It stood at the corner of Bucklersbury and Pancras Lane. The house had been licensed for over 200 years, and at one time part of the bar was used as a book shop, which on closing at six o'clock was partitioned off with a gate, there being two licences issued for the inn at one time. If you leave The Greenman and head to the junction of Queen Victoria Street and Poultry you will find a large metal trourist map, if you stand at this and look just to your left across Poultry you will see St Mildred's Court. On that spot stood St. Mildred’s Church the smallest of Wren’s, taken down in 1872 and the stones were purchased by John Lewis Fytche to be re-erected as a private chapel in Lincolnshire. He had all the stones crated up and taken to the banks of the Thames. From there they were lowered on to barges and taken out to the North Sea, up the coastline to Tetney and on to the Louth canal. Unfortunately, financial constraints prevented the building of the Chapel and the stones were dumped in a paddock at the side of the Hall .